11.3.6 F Analyze basic food preparation techniques and food handling procedures. 11.3.6 G Describe the physical, biological and chemical changes that take place in food preparation. Review measuring techniques via this YouTube clip and then as a class demonstrate and discuss proper measuring techniques and functions of ingredients as students help prepare the “Super Chip Cookie”. Number slips of paper (one for each job of the recipe) and put in a can. Students randomly select a number. The number they pull is related to the job they do. Some get measuring jobs, some get clean up jobs…it’s totally random. In addition to discussing proper measuring techniques and functions of ingredients, be sure to discuss food safety as my students always want to sample the raw cookie dough. Reheat the Super Chip Cookie in a warm oven and cut it into pizza slices for the students to sample. I usually get 16 slices out of a recipe. To help students learn recipe literacy, how to adjust recipes and make baking predictions, complete activities for each (these could be done as stations) with students (see attachments). 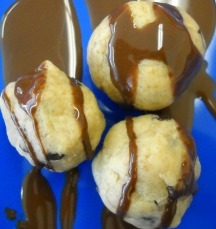 Prepare “Cookie Dough Bites” in the lab. To test their predictions from the previous day have student’s preheat their oven to 350 degrees and place a couple of their cookie dough bites on a cookie sheet and bake for 8-10 minutes to see what happens. When the cookie dough bites come out of the oven have them complete the post experiment questions (see attachments). Give a quiz on measuring, recipe literacy and function of ingredients and then sample the cookie dough bites. This is really an excellent lesson plan—and even the standards are completed which is wonderful! I did this with my classes and they loved it, thanks again Kim Graybill a great lesson is always appreciated. Thank you for all your creative and hard work. This looks like a terrific lesson plan! I am going to use it soon. Thank you! hi admin i really like your blog posts.i read your chocolate chip cookies recipe.please share more recipes.i am waiting for your next post keep it up. I have used this lesson several times. It's wonderful and a great way to introduce ingredient functions.